Home > E-cig > Packaging Information > Parameter Information > SMOK > STICK V8 Kit > Do You Know the Parameters of TFV8 Big Baby Tank and Stick V8 Kit? 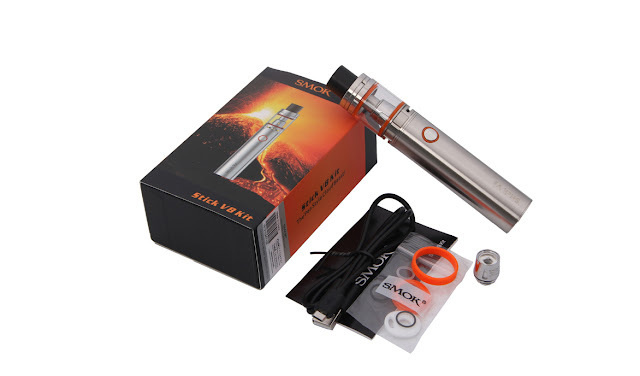 Stick V8 is the newest pen style starter kit from SMOK, which brings the user experience to the top level of its kind, the battery has a 3000mAh super high capacity and 20amps continious discharge. capacity, while its tank is the famous TFV8 Big Baby Tank which is 5ml and shares all the baby beast coils, when used with the included baby M2 coil head,which specially made of stick v8 battery, it will bring you a smooth and flavorful clouds, besides it’s swivel top cap design just brings you so much convenience when refills, all in all, this kit will definitely made to be one of your favorite daily vaping device. Innovation keeps changing the vaping experience.